Star Wars Celebration Europe yielded a wealth of news, with much of the focus being (righfully) placed on Rebels’ third season and the forthcoming Star Wars Story, Rogue One. Another theatrical release, slated for December 2017, received a fair amount of attention as well: the as-yet untitled Episode VIII, helmed by Rian Johnson. Johnson was on stage for the Future Filmmakers Panel at SWCE, and revealed a few interesting tidbits about the next saga film installment. Among those bits was the revelation that for the first time in Star Wars history, there will be no time jump between the conclusion of The Force Awakens and the beginning of this new film. And I think that’s a mistake. This last item is the basis of my argument. The opening crawl has served an essential function in every saga film produced: to inform the audience of the events leading up to the opening scene of the movie they’re about to see. In A New Hope, it set up the space battle and capture of the Tantive IV. It relayed the events that had happened between movies in The Empire Strikes Back and Return of the Jedi. The Phantom Menace used it to lower audiences’ expectations explain the state of the galaxy leading up to the blockade of Naboo. Attack of the Clones and Revenge of the Sith used the opening crawl to similar effect. Even The Force Awakens relied upon it for critical exposition before thrusting us into the First Order’s raid on Jakku. In short, they were necessary to explain what had happened off-screen leading up to the opening events of each film. What else is there to cover? Now we come to Episode VIII, which picks up right where The Force Awakens left off. 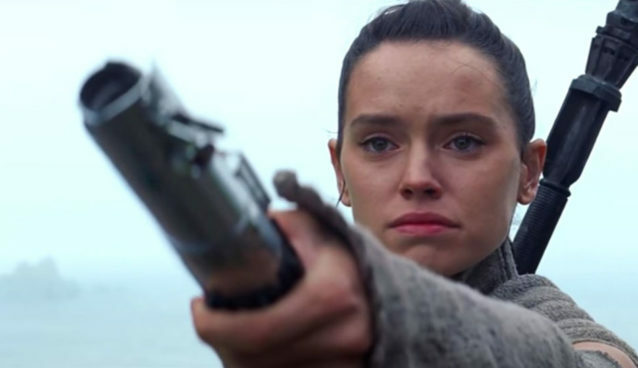 While I don’t imagine the opening shot of next year’s installment will show Rey still proffering Anakin’s saber – because damnit, Obi-Wan straight up stole that thing on Mustafar – to Luke, I do believe we will begin mere days after that scene at most. What could possibly have happened in the galaxy in such a short span of time that the audience needs a recap? Does Disney really think the top-grossing movie of all time went unseen by anyone plunking down cash to go see its sequel? And even if that was true, the movie-going public is smart enough to pick up on the story without needing exposition to do so. All this is to say that there is nothing important to relate in the opening crawl of this movie – so why bother having one? Now, I’m not advocating for Episode VIII to forego the opening crawl. Far from it! (Refer back to my list of Star Wars saga film hallmarks.) Rather, I think the characters should be left to deal with the fallout of the events in The Force Awakens off-camera, and Episode VIII should pick up at the next critical juncture in the storyline. Then we can cover the boring bits in a few paragraphs: Finn is healing, Leia is reeling from Han’s death, Rey has begun training with Luke, Poe went shopping for a new jacket, etc. – and voila! We’re set up for a fresh new adventure by the time the words fade into the stars and John Williams’ fanfare shifts into the first melodic tones of his next opus.